Looking back at 2010, if you’d have asked me, and probably many others, what the best game that year was, I’d have said Bayonetta. It was a breath of fresh air and the Xbox 360 version was treated to glowing reviews across the board. It sold just over 2 million copies on both platforms it was released on, which makes me sad as it deserved much more. It probably lead to SEGA’s decision to not fund a sequel and left fans waiting for the much needed sequel. Step forward 2 years and out of nowhere, Nintendo announces it is publishing the title as a much needed Wii U exclusive. It’s been a long wait since that teaser but finally the game has dropped and I for one couldn’t wait to get my hands on it. For those of you who don’t know who Bayonetta is, she’s a witch of the Umbra clan, and generally goes about kicking the asses of angels with demons and guns, which she has on her feet and hands. Guns as stilettos? Sure thing Platinum Games, sure thing. The basic premise of the story is that Bayonetta’s friend, Jeanne, gets sent to hell so she decides to rescue her. Along the way, she bumps into Loki who generally makes things a bit difficult, because both demons and angels seem a bit angry with him. It’s a step forward from the first game’s amnesia based storyline but after The Wonderful 101, you can’t help but feel that Platinum could’ve wrote a better storyline for this game. The story is helped along quite nicely though by the fact that the characters are larger-than-life. Their personalities shine brightly and will bring a smile to your face, especially Enzo, who appears to based off of Robert de Niro characters. Bayonetta herself is pretty likeable character, even when she’s dealing out sarcasm. The character and enemy designs are gorgeous too, with both being gloriously detailed. Speaking of enemies, they also follow in the games over the top nature, with some bosses being crazy huge and some just being crazy. The only drawback with the character design is the game’s almost childish sense of over sexualisation. To some, it may come off as a bit sexist and even push people away from the title. For me, I know that Hashimoto, female director of Bayonetta 2, gave the okay for the character design. However it’s an argument that should be fought elsewhere and not in this review. The gameplay itself is spot-on. The combat feels perfect and refines the original Bayonetta’s formula. It’s silky smooth and allows you to go from one combo to another seamlessly, even when you switch between the two possible weapon sets that you have. Every smack that you deliver to each enemy gives you a level of satisfaction that you just don’t get in any other game in this genre, and maybe in any game that I’ve played in a long time. The controls are tight too and offer an experience that’s easy to pick up but ultimately hard to master. The only time the controls feel a bit daft, is when you’re controlling one of Bayonetta’s new transformations, the snake. It just feels hard to manoeuvre at times and is the only real gripe I have with the otherwise perfect control scheme. That said, the new transformations feel right at home and help with quickening you’re ability to progress. The level design is pretty great too. 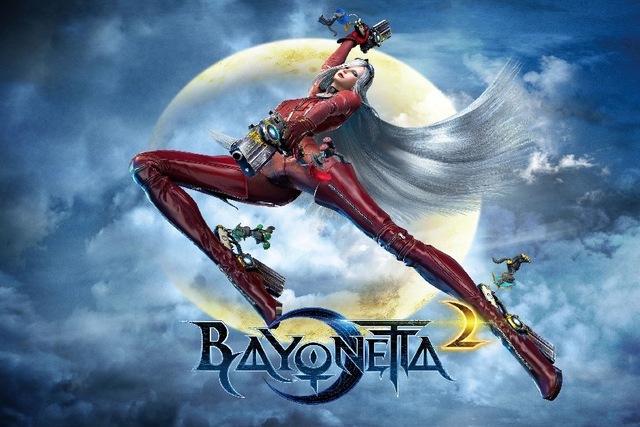 If you’ve played anything by Platinum Games before, you’ll know that they like to throw your perception all over the place and Bayonetta 2 is no different. The game will have you fighting on the side of buildings, debris floating in the air and inside of demons, to name but a few. It all adds to the general over the top nature of the game and it’s something you’ll only get from Platinum. Speaking of which, there’s a metric tonne of references littered everywhere in the game, which are bound to make fans of Platinum and fans of ex-Clover studios beam from cheek to cheek throughout. Some are incredibly subtle and will be something as obscure as a logo or sound clip. Others are a smack in the face of subtly, like the Okami reference (unlock the Panther ability and you’ll see what I mean Okami fans). The script is well written and is splashed in humour, as you’d expect from the Kamiya written scenario. The script helps pull up the otherwise average storyline and makes it just a little bit better. The heavily British cast is also a nice touch, in an industry where American actors grace our ears on a daily basis. The only laughable character, in terms of voice acting, is The Prophet, who seems to be a bit more docile than the character really should be and would be more at home on a kids TV show. What isn’t laughable though is the musical score to this game. It’s a masterpiece in every single way. There isn’t a throwaway track in the whole soundtrack, which is extremely rare in videogame soundtracks. You can tell that the composers gave a lot of love to the musical score and the attention to detail, combined with the shear ability to make you eargasm at will, is just intense on a whole new level. Whether it’s one of the pop or jazz tracks, or one of the masterpieces of orchestra, you’ll be swept away by just how amazingly crafted it is. The boss music is particularly on point and fires home just how intense they can be. You could probably sit down with Bayonetta 2’s story mode and have it finished within 12 hours. The beauty of it though, is the games ability to hook you back into playing, whether it’s throwing new difficulties at you, hunting for those collectables or pushing yourself to get those Pure Platinum ratings on every verse, in every level. The game is easy enough to pick up, that you’ll soon find that you’ll have done multiple run-throughs in no time at all. It’s actually rather scary how addicted you can get to Bayonetta 2. Bayonetta 2 is one of those games that proves that a game can be stylistically gorgeous but also have substance there to keep gamers coming back for more. It takes the original and sprinkles a bit of magic on it, improving it ten-fold. Everything just seems so right about this game. The combat, the mental over the top levels and the musical score are some of the best things in gaming right now, not just in the hack ‘n’ slash and action/adventure genres, but in every genre. Quite easily one of the best games I’ve ever played and will maybe ever play again.